It’s not difficult to pick up a natural dishwashing soap at your local supermarket, or even on Amazon. However, even some of the so-called natural ones have a laundry list of ingredients that I’m not so thrilled about. Plus, many of them don’t work nearly as well as advertised. And of course, there’s always the issue of cost. - In a small pot heat the water and salt, stirring frequently until everything is completely dissolved. Remove the pot from the heat and pour the contents into a small bowl. Set the salt mixture aside. I used kosher salt and it wouldn’t completely dissolve, so I just strained the residual salt pieces out. - Add the washing soda and 1 and 1/3 distilled water to the pot and heat just until dissolved. 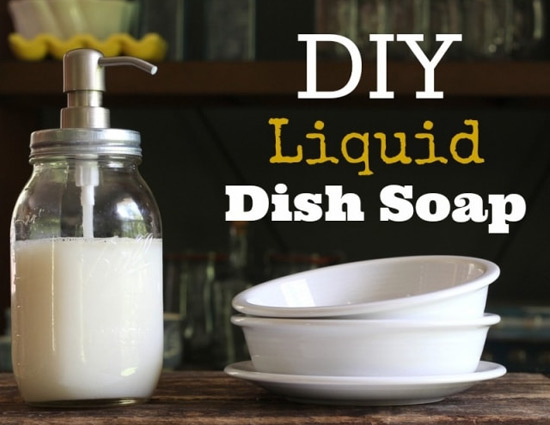 - Add the Sal Suds, washing soda and water, and essential oils to a dish soap dispenser. If your container has a small opening, then it works best to mix this in a glass mason jar. - Add 1 tablespoons of the salt water to the soap and stir. It will turn cloudy and thicken. Add another tablespoon of salt water mixture if you want it thicker. Keep in mind that it may thicken more over time. - Pour the mixture into a soap dispenser.